Did You Get My Email? How About Now? Did You Get It? 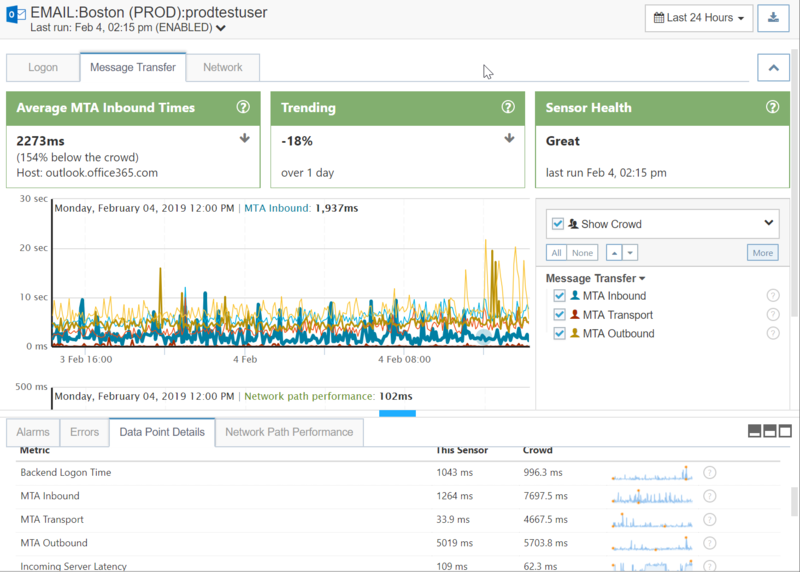 Monitoring and testing Exchange mail queues and mail traffic flow is critical to capacity planning and knowing about outages before it affects end-users and the business. Slow mail traffic, SPAM processing or inbound outages can be extremely disruptive to the business depending on the daily, monthly or quarterly operations. When Exchange mail servers were on-premises it was easier to see email message queues. But now, with Exchange Online, Office 365 and hosted SPAM solutions, an end-to-end picture of email message queuing is extremely difficult to achieve. Except if you have Exoprise CloudReady! Outbound Mail Queues – The time it takes to send an email to the CloudReady auto-responders. This metric measures outbound queue and transfer performance. When comparing against crowd-based metrics, some organizations may filter outbound SMTP traffic which can introduce mail queuing and delays. Usually, outbound SMTP filter is for detecting possible SPAM or Bot email generation on a corporate network. Inbound Mail Queues – This metric measures the total time it takes to reply to an email from the auto-responders to the inbox. This metric measures inbound queue, SPAM and email protection performance.When comparing inbound performance against the crowd, different SPAM protection services may have more overhead depending on the industry required regulations and security layers. Mail Transport Times – This metric is the time it takes to reach the inbound mail queue servers, when it first arrives at the Exchange inbound servers. This metric measures is a subset of the MTA Inbound time as reported by processing servers.When comparing email transport times against the crowd, different email protection services may be located in different regions or have regulatory requirements that forces their co-ocation and thus introduces additional network latency. It takes 5 minutes to sign up and deploy a CloudReady email sensor. Detect stuck email queues and slow SPAM and Email protection providers in a free CloudReady trial. No purchase required and you’ll be able to gather evidence about poorly performing mail queues. ActiveSync is a protocol that’s used to communicate between mobile device email clients and Microsoft Exchange Server. It supports many different device management features and policies. Some Mobile Device Management (MDM) solutions will attempt to fill gaps in ActiveSync capabilities by intercepting, tunneling or proxying ActiveSync mail and message flow. Testing and monitoring ActiveSync performance when using a MDM solution is critical to ensuring acceptable end-user response times. Network administrators and architects must ensure proper capacity for ActiveSync overlay solutions. See ActiveSync sync times and end-to-end mail flow. Capture network path performance to external vendors’ solutions. Tests and monitor provisioning, autodiscover, tunneling & filtering. Measure Service Level Agreements and violations. Suspect your SPAM provider is slowing you down? Want to see how long it takes to send a message and get a response through your outbound SMTP and inbound SPAM provider protection? That’s what a free trial of CloudReady is ideal for. When organizations migrate to Office 365 or change their mail protection providers, message queue traffic monitoring should be put in place to ensure the best performance and that the capacity is there to handle the traffic. 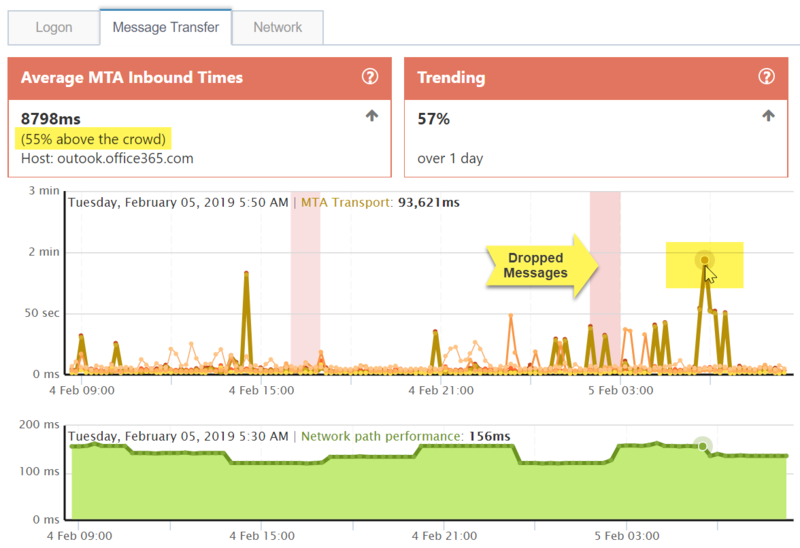 Correlating mailbox usage, sending and receiving traffic for Exchange Online alongside message queue performance is critical. How long to get a message to an outbound recipient? How long are acceptable inbound queues timings? 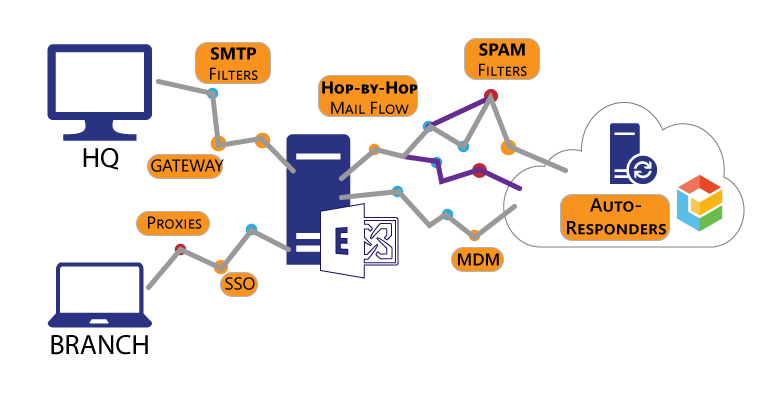 For most organizations using Office 365, Microsoft takes care of mail flow. It’s the simplest configuration and means that Office 365 manages all mailboxes and filtering. Other entities must comply with specific regulatory or business needs such as HIPPA compliance, DLP or custom outbound processing. Extra inbound SPAM filtering or additional outbound processing will add overhead to the mail flow and likely introduce delays that are higher and longer than the crowd when measured using CloudReady. Customer should establish their baselines and SLAs for acceptable delivery with the increased security that their organization might require.